Mothers of the Movement (L-R) Maria Hamilton, mother of Dontre Hamilton; Annette Nance-Holt, mother of Blair Holt; Gwen Carr, mother of Eric Garner; Geneva Reed-Veal, mother of Sandra Bland; Lucia McBath, mother of Jordan Davis; Sybrina Fulton, mother of Trayvon Martin; Cleopatra Pendleton-Cowley, mother of Hadiya Pendleton; Wanda Johnson, mother of Oscar Grant; and Lezley McSpadden, Mother of Mike Brown stand on stage prior to delivering remarks on the second day of the Democratic National Convention, July 26, 2016 in Philadelphia, Pennsylvania. In front of a packed ballroom, Tiffany Crutcher reached into her purse and pulled out a stapled letter, folded and refolded many times over. The letter was from the Department of Justice—only a handful of families in the country have ever received such correspondence from the government. But for the Mothers of the Movement panel that Crutcher sat on, it was all too familiar. In the letter, the DOJ explained why they couldn’t file federal charges against Betty Shelby, the former Tulsa, Okla., police officer who shot and killed Crutcher’s twin brother, Terence. Receiving the letter was like receiving news of her brother’s death all over again, Crutcher said. Then, she remembered a Maya Angelou quote. That letter marked another turning point in a road that has been tumultuous for the Crutcher family. Shelby was acquitted by a jury in 2017 and is working as a police officer again. It’s also a path familiar to many Mothers of the Movement, a group of women who’ve lost family members to police brutality and vigilante violence. Compounding and extending their trauma: feeling stymied by a political and judicial system that has devalued and dismissed their losses. As they discussed on Wednesday, many of them have become increasingly politically involved in order to enact the sort of structural and systemic changes to make black lives truly matter. The panel, held on Wednesday afternoon in Manhattan as part of the National Action Network’s annual convention, also featured Gwen Carr, mother of Eric Garner, who placed her hand on Crutcher’s lap as she spoke about the DOJ letter. Sybrina Fulton, Trayvon Martin’s mother, also spoke, as did Michael Brown’s mother, Lezley McSpadden, Stephon Clark’s mother, Se’Quette Clark, and Botham Jean’s sister, Alissa Findley. It was a rare moment for a group of women in extraordinary circumstances to relish simple, everyday memories of their loved ones. “I’m just trying to tell you how average he was,” Fulton said, recalling how Trayvon fancied himself handsome after a few girls got in his ear. But Mothers of the Movement has become about far more than preserving their family member’s memories, or making visible the ongoing, lifelong trauma of police brutality. In the last several years, members of this sisterhood have campaigned for causes, legislative proposals, and, occasionally, for political candidates. 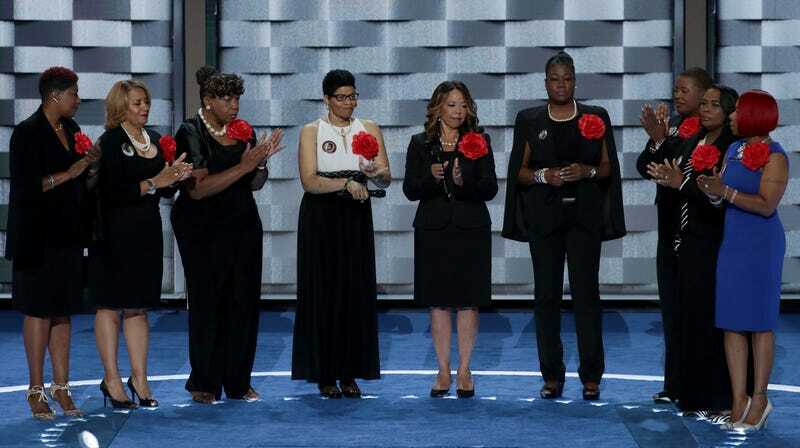 In 2016, several members took the stage at the Democratic National Convention to speak out about gun violence and police killings, and endorse Democratic presidential nominee Hillary Clinton. Three years later, some of the Mothers have either sought office or have launched campaigns of their own to redress America’s criminal justice system. At the panel, Crutcher launched a national Campaign Against Bad Cops, which seeks to abolish qualified immunity, a legal doctrine that shields government officials from being sued for discriminatory actions performed within their official capacity. She’s also calling for amending 18 U.S. Code 242, a federal statute that prohibits any person acting under color of law to violate someone’s constitutional rights. Crutcher and her family want the legal standard an officer has to meet—“willful intent”—to be lowered so federal officials can more easily indict police officers for biased killings. The idea for the campaign was borne out of the DOJ letter she received on March 1, when Crutcher was told by government officials it was all but impossible to charge Betty Shelby with a federal crime under current laws. “They told me that,I would have to go through Congress. And so I held my head up ... and I tell them, ‘well that’s what I’m gonna do,’” Crutcher told The Root after the panel. In the past year, Crutcher has quit her job as a healthcare provider to commit herself to political activism—a path she never would have chosen for herself had it not been for her brother’s death, she says. “The death of my twin brother forced me to get involved [in politics],” she said, citing her work as a field organizer for Doug Jones’ senatorial campaign in Alabama as an example of her recent activism. She’s also gotten involved in several judicial races in the state. “I just developed a newfound perspective on the political process, and knowing that we’ve got to get people in office who care about us, who care about our issues, who care about the black agenda,” Crutcher added. Other Mothers of the Movement have similarly expanded their activism. Fulton spoke about her work expanding voting rights in Florida, a state with a long history of systemic disenfranchisement at the polls. Lucy McBath, whose son, Jordan Davis, was shot and killed by a white man in a Florida gas station in 2012 over an argument about loud music, was elected to the U.S. House of Representatives in 2018, representing Georgia. McSpadden ran for Ferguson city council this year, and while she came up short in that race, she told the room at NAN she was open to running again for an open seat on the council in 2020. These family members look at these roles as an avenue to affect the sort of institutional, structural change that could redress the tragic losses they’ve experienced and prevent them from happening at such disproportionate rates to black Americans. Crutcher echoed some of Clark’s comments, citing civil rights lawyer and U.S. Supreme Court Justice Thurgood Marshall’s work. “This system was not designed for black people, but we have to make it work for us,” she said. For the Crutcher family, this has meant showing up regularly to Tulsa City Council meetings and demanding public hearings be held about biased policing. “We’re forcing the City Council to do their job and figure out why the disparities are so wide. Why blacks are five times more likely to be victims of abuse of force by Tulsa police, and why blacks are two and a half times more likely to be racially profiled and arrested by Tulsa police than any other race,” she said. For Crutcher, the NAN convention was a chance to connect with others who know her struggle intimately—some of whom reached out to her for advice following the violent deaths of their loved ones. She’s also seized the opportunity to spread the word about her Campaign Against Bad Cops, which is still in its nascency. At NAN, she asked audience members to text “Reform” to 668-66, which would connect them to the campaign. She plans on meeting with Rep. McBath on Friday to discuss the legislative changes she’s seeking, and has approached several of the Democratic presidential candidates courting NAN and its network this year. “I introduced myself and I asked one question: ‘Are you prepared or willing to make the killing of unarmed black men a priority?’ And everybody told me, unequivocally, yes,” she said. Presidential candidate Julián Castro, himself a twin (his brother, Joaquin, currently represents Texas as a U.S. congressman), seemed particularly moved by her story, she noted. She also stressed collective action. Speaking on the panel, Crutcher received a roomful of applause when urging NAN members to work together to push through legislative change. “When spiderwebs come together, they can tie up a lion,” she told them. It’s all a part of turning the pain of her brother’s death into purpose, she told the Root. She spoke about her nephew, Terence Jr., a 7-year-old who’s now the spitting image of her brother, and how she feels she’s fighting as much for his life as she is her brother’s legacy. While dropping Terence Jr. off at school recently, Crutcher says her nephew told her about a dream he had about his dad. His father—a lover of gospel music—was singing to him in the dream, he said.